Students have been offered maps of their campus on mobile phones to stop them getting lost. The service at Dundee University aims to help students get to their classes as well as helping them brush up on academic writing skills. 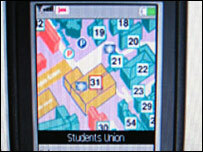 Students are able to download the maps and navigate through them by using the phone's keypad. Information on student and health services is also available and the move has proved to be popular with students. Hannah Whaley, who co-ordinated the project, entitled "MobileMap", said: "A joint university and student association survey indicated that students wanted clearer guidance on where to find information about available services. "The MobileMap project is a response to this, using a novel approach to provide students with easy access to university information. "Many students always carry their phone with them, so the MobileMap represents a way of providing students with information, literally at their fingertips." Almost 1,000 students have already downloaded the maps for free to their phones.